Ah, early fall, that wonderful time of year when the morning and evenings are freezing and the days are summer hot blazing leaving us all to wonder "What Do We Wear?". My usual formula is to wear fall colors in summer fabrics and lots of easy layers. Today's look I wore to church and then out to lunch. This is a summer skirt I bought last year from CJBanks. The first time I wore it in THIS POST it was a hot summer day. Now I styled it for a cooler, early autumn day by wearing it with a black tee shirt and black moto jacket. Here are the two looks side by side: same skirt, different tee. The white tee combined with the white sun hat and striped bag created a lovely summer outfit. I took the same skirt and combined it with a black tee and a black jacket, and now I have a fall look. This is one reason I love skirts over dresses: their versatility! You can create so many more different looks with skirts than you can with dresses. My moto jacket is cropped, which is perfect to wear with a skirt for it accentuates the waistline. Even though I saw so many gals wearing their tall boots at church already, I'm not ready to cover up my toes quite yet. Once I pull those tall boots out, I know it will be months before I see my toes again, so I'm in no hurry. But, I did choose black open-toe wedges to go with my theme of summer clothes/fall colors. This red skirt has the prettiest eyelet hem. Because the dress is so "prim and proper", I wanted to make it a little edgy to create a counter-balance. In addition to the moto jacket, I wore edgy a edgy silver necklace and bracelet. I kept the black color theme going by carrying a black tote. Everything I am wearing in this post. My moto jacket especially is super old. I picked it up on clearance at Forever 21 for only $15.00 in 2013. I can't believe how much use out of it I have gotten and how long I've had it. So much for "fast fashion" haha! Speaking of "Fast Fashion" I have been reading a lot about "minimalism" lately. Someday soon I'm going to do a blog post expressing my thoughts about it. But for now lets just say, I never started fashion blogging to sell anyone anything. I've rarely accepted sponsor posts even though my inbox is filled with requests daily. 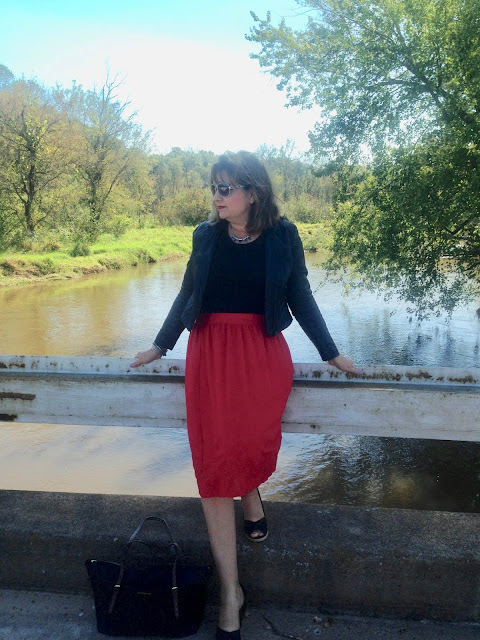 I started fashion blogging because I so rarely see normal, older women like me in advertisements. It's as if we are invisible and we don't wear or buy clothes. I don't know about you, but I don't just want to see what young girls are wearing, I want to see what older women are wearing too. I want to inspire you to shop your own closets and if you do buy anything new, be a wise shopper and shop with discretion taking advantage of sales and coupons! So I work hard to not just show newly purchased items in my fashion posts, but to also post older pieces re-worked into new outfits. So what about you? Do you style your summer skirts for fall? Which look is your favorite? The red skirt with black or white? I'd love to hear from you! Love. This. Outfit! I think I may just prefer it over it's summer styling. You're spot on with your conversion of it to autumn. Like you,I don't blog to sell and I hope that I too encourage others to shop their wardrobes, just as I do every day. There is an obscene amount of waste in our 1st world and each little wardrobe shop or charity purchase makes some small impact on our world. Have a fabulous weekend, x. Thanks so much! I think you really do encourage others to shop their own wardrobes. You are such an inspiration. The skirt looks great both ways, but I really like how you added the jacket to today's outfit and made it perfect for this time of the year. This is a beautiful Fall outfit! That red skirt is gorgeous and I love it paired with your moto jacket. It is a nice color combo that is timeless. Wishing you a wonderful weekend! Thanks Maureen! I hope you have a great weekend too! I love both ways you styled this skirt! Your red skirt looks good with black and white! Both looks are so classic! This is a great transitional skirt! Perfectly styled for fall. I love versatile skirts like this! Thanks Marci! Layers are definitely the way to go during transitional seasons. I love both looks. I'm not ready to let go of my summer wardrobe, so I'm hoping to be able to transition some pieces into fall too. Thank you! I have no choice anymore, as it's cold here already. In the 50's all week. One thing I love about blogging is how it inspires me to look at clothing I own in different ways and put together outfits I wouldn't have thought of. That skirt is darling both ways you've worn it! Definitely! I have been thinking of giving up blogging because it takes such a chunk out of my schedule, but then I fear I would go back to my old ways of dressing, and I don't want to do that. Fashion blogging keeps me on my toes! Amy, what a gorgeous skirt on gorgeous you! Man, I love that color! I love remix posts - that's why I have my 30 ways to wear series and link back to other times and different ways I've worn things. I think it's good to see more people represented in blogging, and show that you don't need a new outfit all the time just to blog! Oh, I know. I hate it when blogs are all about selling. I like to see what people are wearing. I can't stand the posts that show clip art of pieces with links to stores. I never look at those posts. But, I also know a lot of readers want that. Everyone is different. This really does work for the Fall, Amy! I love that skirt and the eyelet detail on the bottom. I'm actually thinking of getting one of my leather moto jackets out today, because we're finally having Fall weather. I love the shape and length of your leather jacket here. Thank you! I love red! This is such a classic fall look dear! Loving the pop of red from your skirt, really pretty color! This is such a pretty skirt, I wouldn't want to put it away. So nice you were able to style it for fall. Thanks Kim! I can wear it in fall, but not winter. The cool, breezy cotton wouldn't be warm enough for me. I think this is fabulous Amy!! That's the advantage of red, because it really works for any season. Although I should say that about any color...they all should be seasonless!! Thanks Jodie! I agree about the red, it seems to work for any season. Very pretty Amy! Love the moto jacket and i do love black and red together.